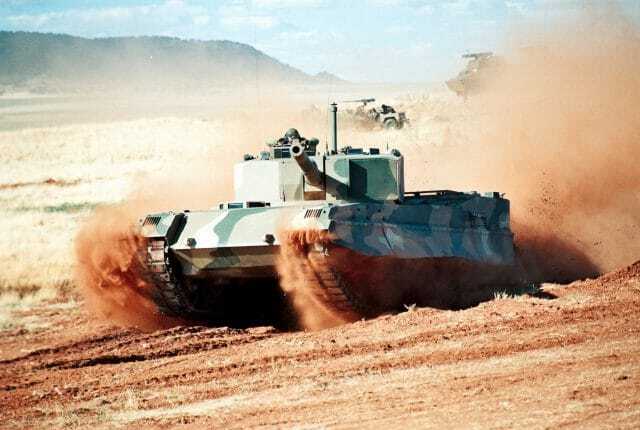 Years of technological development in South Africa have culminated in a locally-built prototype Main Battle Tank (MBT) called the ‘Tank Technology Demonstrator’ (TTD). As there was no perceived external threat the TTD served as a test bed for the most modern technologies of the time in the areas of firepower, mobility, and survivability. 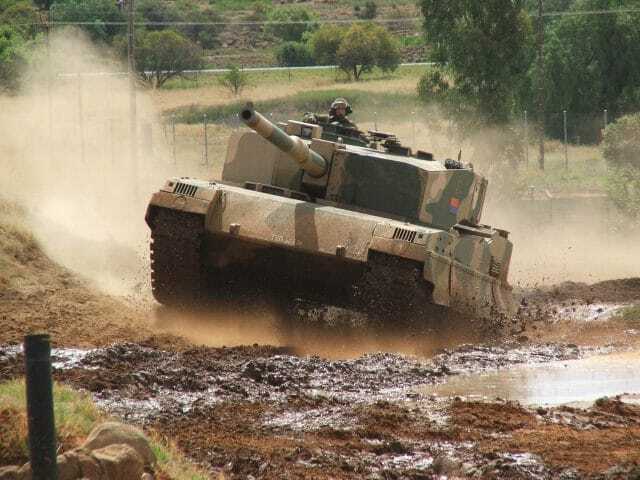 According to the then Defence Minister Kobie Coetsee (1993-1994), “the tank compares well with overseas systems such as the Leopard 2 and American Abrams“. The South African Defence Force (SADF) identified, in the early 1980s, the need for a completely new generation of indigenous MBT. This project, code-named “Loggim”, was assigned to the Reumech Olifant Manufacturing Company (OMC), which produced the hull and Lyttleton Engineering Works (LEW), which designed the turret and main gun. Other companies involved in the project were KENTRON (which later became Denel Dynamics), integrators of Systems Technology (iST) (now IST Dynamics), Grinaker Electronics, Eloptro (specializes in optics), Booyco Engineering (air conditioning systems for armored vehicles), M-TEK (specialises in the design, development, control and manufacture of precision electro-mechanical components and sub-systems), Prokura Diesel Services (PDS)(supply or develop powerpacks for armoured vehicles). With the end of the Border War (1966-1989), defense spending was no longer a priority and funding was cut for the project in the early 1990s. Not wanting the technological advancements and effort to go to waste, the SADF and the Armaments Corporation of South Africa (ARMSCOR) decided to produce one vehicle to showcase the TTD`s potential capability and serve as a development platform. The TTD was completed in 1992. By 1994, South Africa held its first free democratic elections, subsequently, sanctions were lifted and South Africa was again allowed to purchase and sell arms on the international market. It was argued by the new South African National Defence Force (SANDF) that a modern MBT could just as easily be purchased from an international supplier and at a far more competitive price than it would be to build locally. The TTD served as a culmination of all the technological research and industrial capacity available in South Africa during the early 1990s with subsequent comparisons to be made with other MBTs of the era. At the time of its development, the chief opposing MBT was considered the T-72M with its 125 mm main gun. It could be argued that, if the decision was taken to produce the new MBT, the final variant would have been strikingly similar to the TTD. It was envisaged that 282 of these MBT`s would be built on completion of the project in order to replace the Olifant Mk1A and Mk1B. 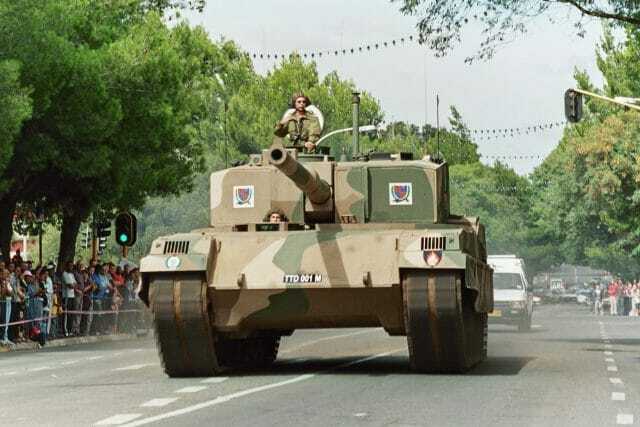 With the subsequent cancellation of the MBT project and no acquisition on the table, the TTD was donated to the South African Armour Museum in 1996/7. The design, development, and production of the TTD were undertaken to showcase what would be possible if an indigenous MBT was produced. The TTD design made it easily possible to optimize the vehicle according to mission requirements, as subsystems could be tailor-made. One of the key design requirements of the TTD was that it had to be able to self-deploy quickly via road over distance if transports weren’t available. The TTD is powered by a twin-turbo intercooled V-8 diesel engine that delivers 1234 hp (920 kW) at 1200 rpm. This translates into a power-to-weight ratio of 21.16 hp/t. The maximum torque that can be produced is 4400 Nm at 1500 rpm, which allows the TTD to accelerate from 0 to 30 km/h (18.6 mph) within 5.1 seconds. It has a top speed of 71 km/h (44 mph) on road and 35 km/h (22 mph) cross country. The engine is cooled by a water-to-air system which involves splitting the air and water to the intake manifold. Additionally, the warm exhaust gasses are mixed with the cooled air to reduce the TTD`s Infrared (IR) signature. Doing so makes the TTD less visible to enemies using IR vision which detects thermal energy. The power pack is equipped with a Management System (MS) which regulates the power output at 100% at ambient temperatures of up to 48o C (118 °F). Higher temperatures require the MS to reduce power output to protect the powerpack, which subsequently aids in increasing its service life. The engine is driven through an automatic 4F 2R cross drive gearbox with four forward and two reverse gears. The final drives incorporate a planetary gear reduction with an offset configuration which can handle up to 1500 hp (1120 kW) at 1200 rpm. With fuel efficiency in mind, the powerpack would switch from 8 to 4 cylinders when the TTD stood still. The steering allows the TTD to pivot turn and is infinitely variable for large, fixed and tight turns. A turning circle at low speed is 15 m (49 ft) wide and 36 m (118 ft) at high speed. Suspension consists of a torsion bar with friction rotary dampers and hydraulic bump stops and makes use of live track which produces lower noise and lower transmission vibration which intern provides more stabilized fire while on the move. The live track runs over seven rubber-tired dual road wheels with a front idler, a rear driving sprocket and four return rollers. The TTD`s ground pressure is 0.93 kg/cm2. The TTD can climb a gradient of 60%, a side slope of 30% and can cross a 3.5 m (11.5 ft) trench. Unprepared, the TTD can ford 1.5 m (4.9 ft) of water. The TTD had a minimum of 102 and a maximum of 112 track links, depending on the required track tension. The road wheels are mounted on a torsion bar system with 500 mm (19.7 in) of vertical travel (320 mm up and 180 mm down). The impact energy on the road wheels is absorbed by wear resistant, maintenance free hydraulic variable-resistance friction dampers and hydraulic bump stops. The braking system is integrated into the gearbox and comprises a primary retarder and double disc serve brakes. This allows the TTD to come to a complete halt from 56 km/h (35 mph) in 6.8 seconds. The resulting heat generated by the friction is dispersed through the brakes’ air-cooled system. In case an emergency engine start is required, a hydraulic start system is incorporated should the electrical one or the starter fail. Another key design requirement was that the TTD had to be able to operate far away from any workshop support and was to be maintained by reservists. The TTD has a 1600L (422 gals) diesel fuel tank which gives it a road range of 400 km (249 mi) at 50 km/h (31 mph). Cross country range is 300 km (186 mi) at 35 km/h (22 mph). On sand, the range is reduced to 150 km (93 mi). The TTD has a maximum reverse speed of 32 km/h (20 mph). The TTD featured the most modern tactical radio communication equipment of the time, which allowed for reliable command and control, enhancing the tank’s force multiplier effect on the battlefield. The overall interior design assisted in reducing acoustic noise, thereby improving situational awareness and reducing crew fatigue. The TTD is fitted with a 7.62 mm coaxial Browning machine gun which is fed from a 2000 round bin. Additionally, a 7.62 mm General Purpose Machinegun (GPMG) can be fitted to the roof. The tank is equipped with an 80 liter (20 gals) internal drinking water tank for the crew which could be accessed at the loader’s and driver’s stations. A fume extractor fan helps clear the interior crew compartment of excess fumes produced when firing the main gun. The TTD carries a standard complement of four crewmen, consisting of the commander, gunner, loader, and driver. The fighting compartment was designed with ergonomics in mind, which would maximize efficiency and reduce crew fatigue. The commander’s station is located on the right side of the turret and is equipped with a sunken cupola which offered a 360-degree field of vision through six periscopes. The sunken cupola reduced the overall height of the vehicle as well as the chance that a partial hit could deflect into the crew compartment. The commander’s station consisted of traditional mechanical sights. It was, however, planned that digital screens be installed at a later point, which would have linked to the gunner’s sight. The commander has at his disposal a CS60N primary stabilized commanders sight offering a 360-degree panoramic detection, recognition and identification view via a periscope in the cupola, which has x3 and x10 magnification options. It features a two-axis, gyro-stabilized mirror head. Additionally, a 3rd generation image intensifier night channel is incorporated, which significantly enhances situational awareness and combat ability in low-light conditions. The MBT variant would have seen a thermal imaging intensifier added. Just below the commander’s station, on the right side of the turret, is the gunner’s station, which is equipped with day/night capabilities. This station would also have received digital display screens if the final MBT variant was built. Entry and exit for the commander and gunner are through the commander’s hatch. The loader’s station is on the left side of the turret and has a dedicated episcope for better situational awareness. Entry and exit for the loader were through his own dedicated hatch. The driver’s station features an ergonomic design, with an analog instrument panel and a yoke-type steering stick which improved comfort and reduced driver fatigue. The driver’s station would also have received a digital screen overhaul in the final MBT variant. The driver makes use of three episcopes, allowing better visibility, thereby increasing situational awareness. The central episcope can be replaced with a passive night driving periscope allowing full night capability. The driver can enter and exit his station through a single-piece hatch above their station while an emergency escape hatch is located underneath their seat in the floor. 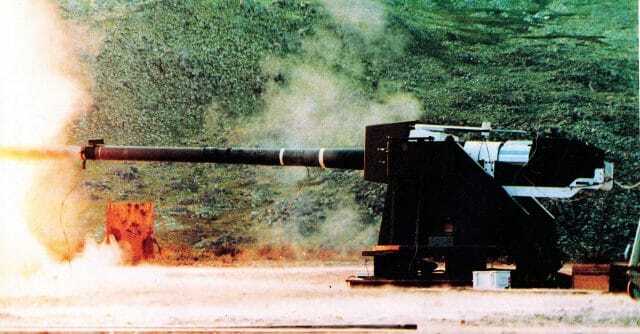 For testing purposes, the TTD is fitted with a standard 105 mm GT3 QF semi-automatic main gun developed by LEW in South Africa. The 51 caliber barrel is rifled and is encased in a thermal shield. A total of 54 main gun rounds are carried, of which 6 are kept in the turret basket, 16 rounds are kept in a rotating carousel and 32 in ammunition racks to the left of the driver. Available main gun rounds consist of Armor Piercing Fin Stabilised Discarding Sabot-Tracer (APFSDS/T) with an effective range of 4000 m, High Explosive Anti Tank (HEAT) and High Explosive Squash Head (HESH) with an effective range of 2000 m and High Explosive Tracer (HE/T) with a range of 4500 m.
The production variant main gun would have been a LEW 120 mm smoothbore barrel or as part of its planned upgrade evolution a 140 mm smoothbore barrel. According to sources, three 120 mm main guns were built. The main gun can depress -10 degrees and elevate 20 degrees. The breech slides horizontally and is semi-automatic. Tests revealed that first round hit probability of a T-72 sized target at 2 km is greater than 84% while static and 75% while in motion. The gun drive makes use of a 48 V compact brushless DC motor, two pinon azimuth drive and linear extension elevation drive. The azimuth drive can rotate the turret a full 360 degrees in less than 10 seconds with an acceleration of 0.6 rad/s. Elevation speed and acceleration are rated at 0.6 rad/s. Also included is a two-axis primary stabilized GS60 gunner sight with an x3 and x8 magnification. 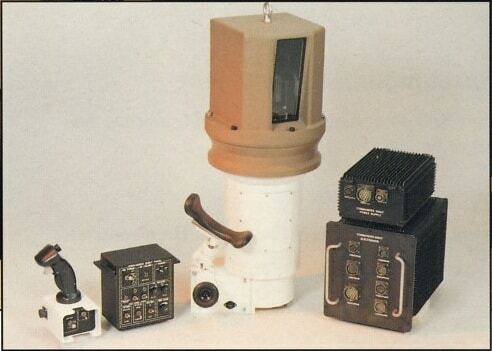 Additionally, a laser range finder with a 200 – 8000 m (218 – 8749 yd) range is integrated together with a 120 element thermal imager which is projected on monitors at both the commander and gunner stations. The gunner also has at his disposal a mechanical telescopic auxiliary backup sight. 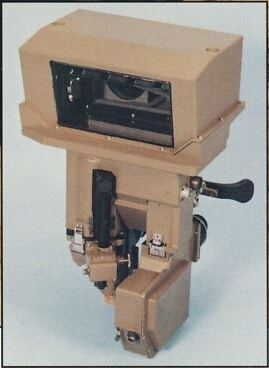 GS60 Primary stabilized gunner sight – From Denel marketing poster “Armoured Sighting System – GS60 – Primary Stabilized Gunners Sight”The main gun ammunition is stored in the turret and floor. The ready rounds are kept on the turret floor and turret bustle via a loading port. Ammunition is provided by a rotating carousel which supplies ammunition to the loader who can load between 6 and 8 rounds a minute. The Fire Control System (FCS) makes use of an RS485 serial databus linking all the sub-systems to allow for effective hunter-killer mode, allowing the gunner and commander to hunt for enemy targets independently. Once a target has been identified, the main gun is slaved on to the target by the gunner or by the commander with an override facility. The fire directing system makes use of a compact 48VDC electro-mechanical gun drive with a fully integrated digital FCS. Reaction time from target acquisition to round on target is less than 9 seconds. The FCS calculates ballistic offsets and improves first round hit probability by incorporating the TTD`s tilt angle and forward speed, the target moving speed, crosswind, barometric pressure, outside temperature, ammunition temperature, and target distance drop and flight speed. Additionally, the incorporated muzzle reference system allows for more accurate calibration purposes. The FCS computes a ballistic calculation in 0.01 mrad and has a cycle time of 5 ms. The TTD`s passive armor comprises of multiple layers of spaced armor with the effective thickness of the frontal glacis being 750 mm. The turret thickness and composition are classified. Both the frontal hull and turret are said to protect against 125 mm APFSDS and HEAT rounds. The crew and critical subsystems are protected against 23 mm Armour Piercing (AP) round attacks from the flanks and rear. Top armor is rated against 155 mm air-burst rounds. The bottom hull is rated against anti-tank mine blasts under a track. Additional reactive armor packages were to be added to the turret and hull to counter anti-tank missiles. The TTD`s onboard fire explosion suppression system is automatically activated by optical detectors which are fitted in the turret and driver’s compartment. Should an explosion occur in the turret bustle magazine, blow off panels allow the explosive energy to be directed outwards, thereby reducing the risk to the crew. The crew compartment is also isolated from the bustle, thereby maximizing survivability in case of a hit on the bustle. The engine compartment has its own dedicated fire extinguishing system which activates automatically when a fire is detected. The system can also be activated manually. The fuel tank is filled with “Explosafe” which prevents the formation of destructive pressure after the ignition of vapors or gases. The TTD has Biological and Chemical (BC) protection via seals and overpressure system at 600 Pa in addition to an air filtration system. The interior ergonomics allow for individual crew Biological-Chemical protection as well. Crew comfort in warm weather conditions is assured through an interior cooling system which consists of a 12 kW macro and 5 kW micro cooling which enhances crew durability. The interior of the TTD is fully lined with an anti-spalling layer to reduce the chance of ricocheting shrapnel. The integrated cooling measure significantly reduces the TTD`s exterior IR signature. On either side of the turret, behind a sheet of armor, is a bank of four 81 mm smoke grenade launchers. The TTD is fitted with an exhaust smoke generating system. The TTD embodied the most sophisticated technologies, technical expertise, and manufacturing capabilities available to South Africa in the mid-1990s. MBTs are very expensive to operate, maintain and even more so to deploy. They serve as a deterrent against aggression and are often only deployed during times of war which makes the justification to fund them very difficult to the general public. 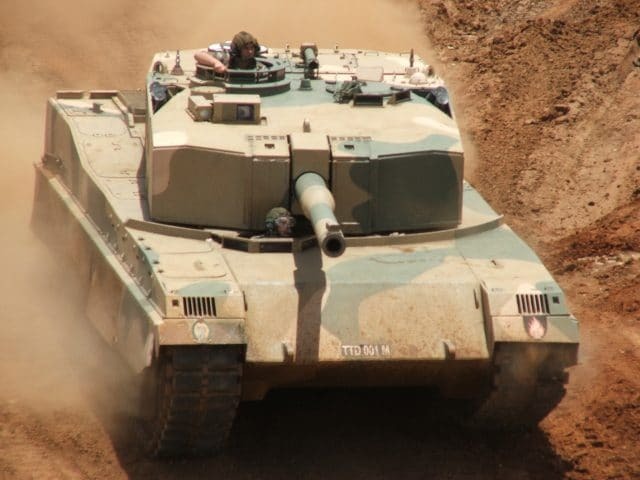 With the cancellation of the “Loggim” project and no orders placed for a new MBT by the SANDF, the TTD was donated to the SA Armour Museum where it is on display. In 1998, the South African government announced that no new MBT was to be funded in the foreseeable future, as the Air Force and Navy required a complete overhaul. This announcement sparked some heated concerns from South Africa’s neighbors. It could be argued that, if the envisaged 282 new MBTs were ordered domestically, their strategic influence on Southern Africa would have been significant and could very well have sparked a regional arms race. Between 2000 and 2005 South Africa upgraded 26 of its Olifant Mk1B to Mk2 standard which makes extensive use of various TTD subsystems. Propulsion Twin-turbo intercooled V-8 diesel engine which produces 1234 hp (920Kw) @ 1200 rpm. (21.16 hp/t). Armor The effective thickness of the frontal glacis is 750 mm. Turret thickness and composition classified. Multiple layers of spaced armor to protect against 125 mm APFSDS and HEAT rounds. Additional reactive armor packages can be added to the turret and hull to counter anti-tank missiles. The author would like to thank the team at DENEL VEHICLE SYSTEMS: OMC for digitizing the TTD videos and allowing Tank Encyclopedia to feature them in the article. Citizen Reporter. 1993/4. The Citizen: SA tank ‘compares with the best in the world’. Date of publication: unknown. Volker, W. 1994. PARATUS: LEW smooth-bore gun for the Tank Technology Demonstrator. Feb, page 67. Tank Technology Demonstrator Illustration by Tank Encyclopedia’s own David Bocquelet.